A new prime minister doesn’t walk alone, which, if you truly understand the job, is a good thing. Instead, he or she takes office together with a a few dozen other elected Members of Parliament, each in charge of overseeing a particular ministry of government. Together, this cabinet advises the PM and in many ways, represents our government to us and the world. So naturally we comment on and debate the qualities of those appointed to these key roles. In decades past, ministries were a power bases, rewards for different factions of the ruling party. But with the centralization of power in the Prime Minister since Pierre Trudeau and his successors, cabinet has instead become an extension of the PM’s philosophy of governing. Long to reign over us. 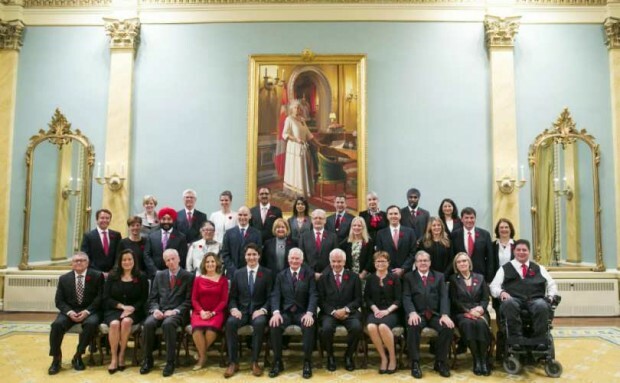 Our new Cabinet has been celebrated as the most diverse ever, not least as the first to feature equal numbers of men and women, plus a variety of immigrant or visible minority members. It has been said to “look like Canada”, and to a certain extent, that’s true, although some say it didn’t go far enough. However, even as these MPs walked up to Rideau Hall to swear in together, some of my Facebook contacts predicted that soon the complaints of diversity at the cost of merit would be heard, from the white male end of society, and sure enough, that came true. I see people complaining that cabinet should not be selected by ticking off demographic boxes, but based on each individual’s resume of training or job experience. Yet those complaining seem too distracted by diversity to actually look into the qualifications of these cabinet appointees, because in many ways, these picks actually seem a better fit with portfolios than has usually been the case. For example, our Minister of Health is, for the first time ever, an MD. Defense is held by a decorated veteran. The Minister for Sport is a Paralympian, the Minister of Veterans Affairs uses a wheelchair, the Minister of Science is a scientist, the Minister of Transport was an astronaut(! ), and so on. So if you are arguing for merit-based appointments, it would be very hard to criticize this list. However, I will actually argue against the merit case for cabinet. For example, Stephen Harper’s first defense minister was a veteran, yet his tenure was so disastrous he was quickly replaced with longer-serving non-veteran ministers, and Harper’s most prominent Minster of Veteran’s Affairs, a long-time police veteran, was likewise a tone-deaf choice. Government is enacted by our professional civil service, where relevant merit is the primary consideration as people are promoted up to Deputy Minister. But Members of Parliament are elected by popular vote, not merit or suitability for a particular ministry. Their purpose isn’t to be an expert at a specific portfolio, but to advocate for our needs in government, and for their ministry’s needs in cabinet. That role relies on more general skills like communication, integrity, broad-mindedness, the ability to learn quickly and apply perspective to protect the public interest. Let the Deputy Minister be the dispassionate technical expert, while the Minister is the passionate advocate. Further, if MPs and cabinet represent the electorate, then it makes sense that their composition should mirror ours, as much as possible, so that many parts of society have their own voices at the table. Yet this need not be an either-or situation, merit vs. diversity. Rather, I believe this current cabinet roster proves we can have Ministers who bring great merit and suitability to their posts AND reflect Canada’s true diversity. If you think about it, what would it say if that were not the case in 2015? A version of this was published as my Root Issues column in the Barrie Examiner as "New cabinet ministers appear to have merit"
Erich Jacoby-Hawkins is a director of Living Green and vice-president of the Robert Schalkenbach Foundation.